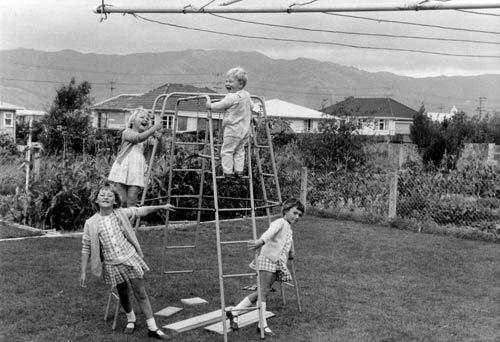 The baby boom was a period of significantly increased and relatively high fertility which occurred in New Zealand between the mid-1940s and the early 1970s. The fertility rate was more than four births per woman at its peak in the 1960s, which was high internationally. The Faulknor children of Wainuiomata (known as 'Nappy Valley' at the time because of the number of families with young children) represent this population trend. Clockwise from bottom left, Sandra was born in 1961, Stephanie in 1965, Trevor in 1967 and Janine in 1963.